“Communication- the human connection- is the key to personal and career success”. We believe that language should not be a problem when you want to share your ideas with the world. Also, translating your website should not involve coding skills. Newspaper lets you translate all the strings which are present on the front end of your website. In just a few seconds, every string is automatically translated in one of the dozen languages available. We take our community very seriously and we encourage our members to share the modified translations. 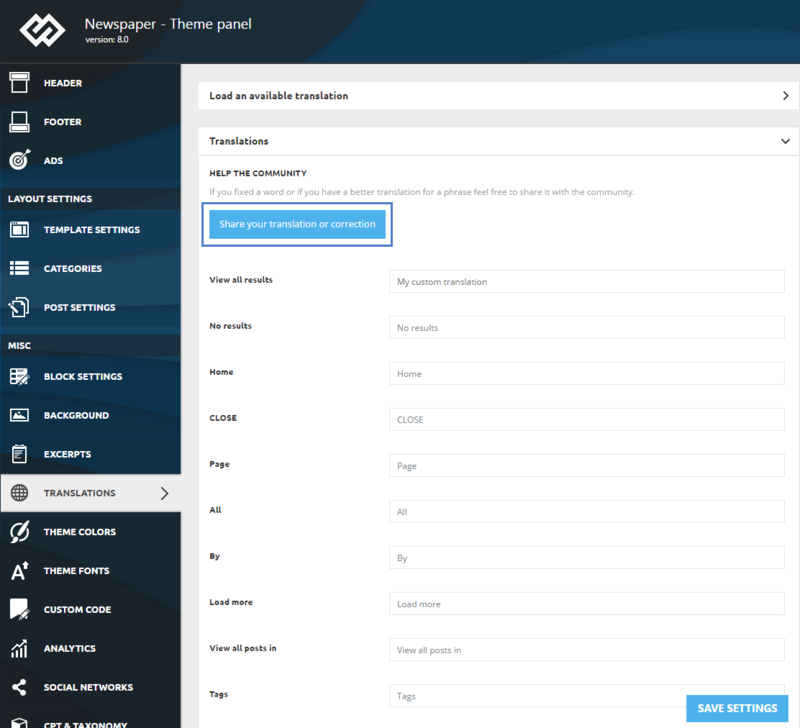 Step 1 – Go to the WordPress Dashboard > Newspaper > Theme Panel > Translations > Translations. Step 2 – Translate every element that you want. If you already loaded one of the available translation, simply correct the words that you find to be incorrect. Step 3 – After you finish adjusting the translation, click on the Share your translation or correction button. Step 4 – Next, a new popup window opens. You have to select the desired language and press the Send translation or correction button. Step 5 – Click on the Save Settings Button.